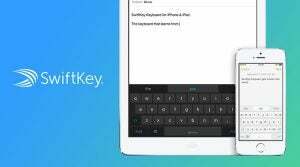 What is SwiftKey for iOS? SwiftKey is one of the most popular alternative keyboards available on Android. Now that Apple has finally allowed third-party keyboards in iOS 8, you can now use it on your iPhone or iPad as well. Like most phone keyboards, even Apple’s now that it has QuickType in iOS 8, SwiftKey aims to learn what you type. But SwiftKey takes this to a new level thanks to SwiftKey Cloud. As the name suggests, it stores the ‘Learned Language’ online so you can use it across multiple devices. It doesn’t just sync information gleaned from your typing, though. It also learns from how you use language on social networks and other services. You can link Gmail, Twitter and Facebook and others, the info from which SwiftKey uses to build a language profile. How acceptable this is will depend on your attitude to privacy and risk. It should be stressed, however, that you don’t have to use SwiftKey Cloud to get the benefits of SwiftKey. It will still learn your language habits from you using the phone and store that data on the device alone. It also supports ‘Swype’ style input, so you can slide your finger across keys to spell out the word you want — called SwiftKey Flow here — multiple languages and two themes, a light one and dark one. SwiftKey is one of the slickest smartphone keyboards you’ll find. Its predictive system is the most powerful we’ve seen. If you do choose to use SwiftKey Cloud, it quickly learns any phrases you use often. But even if you don’t use the cloud system, it doesn’t take long for it to pick up on common phrases and bits of information, such as email addresses. Flow works brilliantly, too. This style of typing, where you swipe across the keyboard instead of pressing, takes a little getting used to, but it’s worth persevering with. It’s particularly useful when you’re in a rush and only have one free hand. It’s much quicker to type one-handed with Flow than it is normally. But even if you don’t like Flow, you still get to enjoy SwiftKey’s predictive system. There are some subtle but useful differences between it and the standard keyboard that make it easier to use, too. The lack of a ‘Mic’ key to the left of the spacebar means it’s more central, and there’s a useful punctuation key to the right of spacebar. Press and hold the punctuation key and you get quick access the ‘@’ and other common keys. We also prefer how it handles switching between upper and lowercase. Apple’s keyboard confuses matters thanks to the ambiguous shift key behaviour and the fact all keys remain uppercase in either mode. SwiftKey’s shift button is clearer and the keys change according to which case you’re using. There isn’t a huge amount wrong with SwiftKey. What problems exist are largely minor bugs, potentially at the OS-level, and other tweaks we’d like to see. For example, when the keyboard appears in the Messages app it doesn’t automatically scroll to the latest messages, and the keyboard sometimes ‘pops’ into view rather than gliding in. Neither are critical. The benefits are less pronounced on the iPad than they are on iPhones. iPads don’t get (or need) SwiftKey Flow, and the predictive element is less essential on a larger screen. It would also be nice to have the option for a personal offline backup instead of SwiftKey Cloud, though iCloud backups cover this to a degree. Finally, while you can download and use SwiftKey on an iPhone 4S, we wouldn’t recommend it. Not only does iOS 8 run poorly on the iPhone 4S, SwiftKey’s prediction bar can’t be removed and takes up a large chunk of screen space. If you’re running iOS 8 then SwiftKey is an absolute must-have. It’s a noticeable step-up from the standard iOS keyboard and it’s a free download. There’s no reason not to try it. The post SwiftKey Keyboard for iPhone & iPad appeared first on Trusted Reviews.